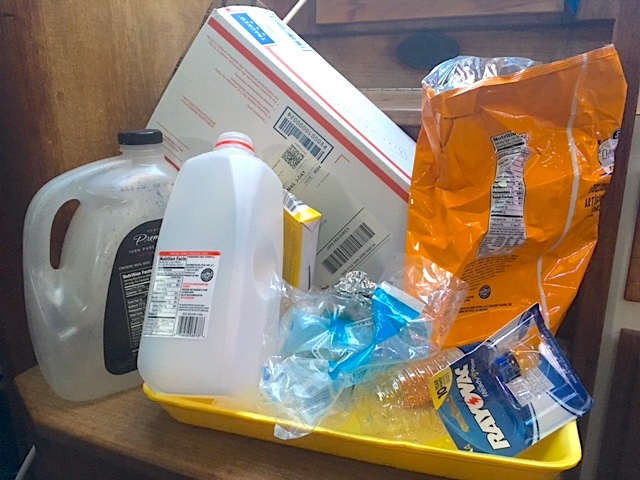 If the cruising sailor isn’t careful, packaging trash can overwhelm a small boat, taking up a lot of valuable space, and creating a situation where every time you want to do anything you have to move it out of your way. This problem isn’t limited to your galley of course, every part of a boat can generate trash. Okay, But How the Heck Do I Accomplish This? Feel like I’ve just thrown you to the sharks? Let’s unpack my three simple rules for some tips on putting these guidelines in place in your water life. The best way to reduce the amount of trash your galley and boat generates is to not buy anything in a package. That’s a tall order these days, but buy in bulk and cook from scratch instead of using processed foods and you’ll be way ahead. Anyway, in practice this tip more often means leave packaging at the source. 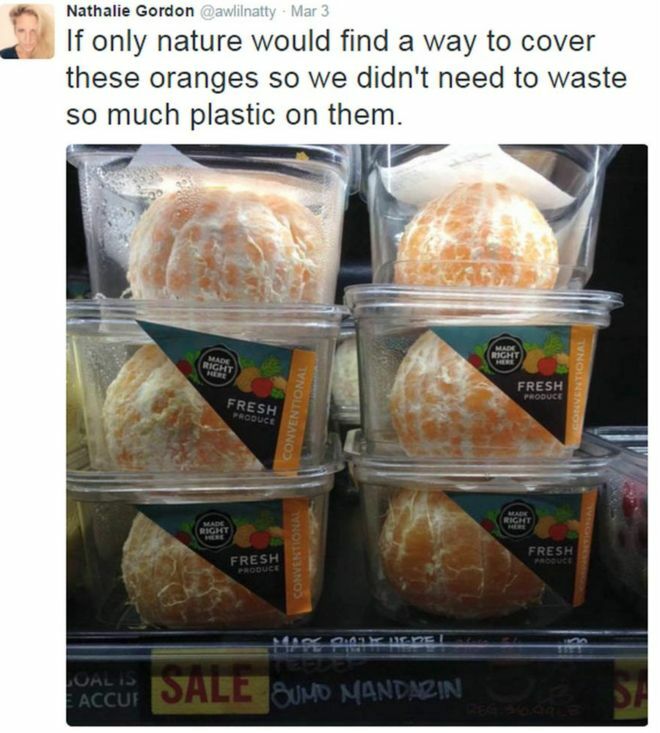 Retailers are allowing way too much packaging to clutter up their aisles. Big box stores are the worst offenders, but even grocery stores are bad about this. The boater needs to grow a pair and exercise her/his personal power to reject the plastics and excessive packaging. When traveling by boat, and walking to the store, you learn really quickly to leave the bulky boxes behind before you pack your purchases into a backpack. Not only am I a live aboard boater with limited space for storage, and almost zero space for trash, I’m also just enough of a b**** to stand beside the trash can in front of the store unwrapping all my purchases and filling the store’s trash can with cardboard, plastic and paper. I live in hope that by leaving all this extraneous rubbish behind at the store and forcing them to deal with it, I’m pointing out to the retailers that people don’t want the packaging. My husband hates this, it embarrasses him. Which may be one reason he likes to do the shopping without me. But my point of view is, how will the vendors know we hate all the packaging trash if we don’t show them? A picture is worth 1000 words. If you haven’t watched The Story of Stuff go check it out for some more background on why we all need to quit the trash culture. Take your own shopping bags and or Collapsible Storage Bins, to the store or farmers market. Don’t buy anything in single serving containers. Yes I’ll make an exception for beer. (As long as you Do Not sink the dead soldiers.) Alternatively you could buy a stainless steel YETI Rambler Bottle. It’s the same size as a standard glass growler. Refill it at the local craft beer brewery in your next port. You know you’re going there anyway. Buy the largest container you can of just about anything – within reason – 50 lbs of flour would be silly for two sailors in a 30′ coastal cruiser. Buy unflavored products (yogurt, oatmeal, rice etc). Add your own flavorings and seasonings, just like you would for any other dish you make. Kick the word “convenience” to the curb. It’s marketing speak that masks higher price, lower nutrition, increased chemical content, waste and pollution and it rarely saves time. Buy whole lettuce, spinach, kale and beets rather than prepackaged plastic bags of greens – they’re better and fresher. Wash them and store in Ziploc Gallon Storage Bags. Your greens will last longer. 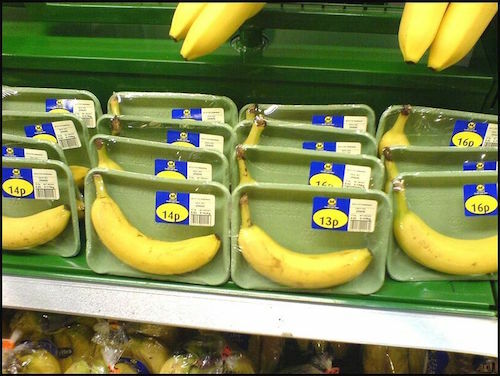 Yes, there is a place for plastic – reusable plastic containers that is. Ziploc bags can be washed and reused all over the boat. Empty milk jugs make excellent dry staple containers and great bailing scoops for the dinghy. But remember to tie that sucker on or it will blow away and fall overboard adding to the shoreline garbage problem. You don’t want to trash the seas, but then you don’t want to attract bugs either. So rinse non-reusable containers well in saltwater and dry thoroughly before storing them for recycling when you get to port. Crunch, crush, collapse, or cut up things to save space. Store small things inside other larger containers, or in the bags and collapsible bins you use for shopping. Most marinas these days have some form of recycling bins. If they don’t, ask them what to do with recyclables. The more boaters ask, the more they’ll think about getting with the program. There’s no doubt this is all tough, but do it for a while and see if it doesn’t point out the bad habits you’ve fallen into in your shopping. The changes you make might help curtail waste, save you money and maybe even have you eating healthier.